The lovely people at Telscombe Stud Farm have opened their doors once again to the general public in the aid of charity. The Stud Farm held open days on Sunday May 6th and Monday May 7th to raise money for the Chestnut Tree House and us. Tim, Nina & Eliza and all their team worked so hard in preparation for and on the days to make the event as fun as possible and to raise as much as they could for their charities. During the two days there were tractor rides around the farm with a very informative commentary from Tim. There was pony rides, face painting, an impromptu dog show, clay pigeon shooting and a rifle range. Delicious home made cakes provided by the generous team of helpers, along with fresh burgers and sausages made with locally produced meat, proved to be in great demand, with lots of gluten free options available. The farm is also home to racehorses of Studfarm Racing, which are trained on the farm and up on the South Downs by Tim’s daughter Camilla and raced all over the country. They have also raced in Dubai and Australia, coming 5th in the Melbourne Cup. 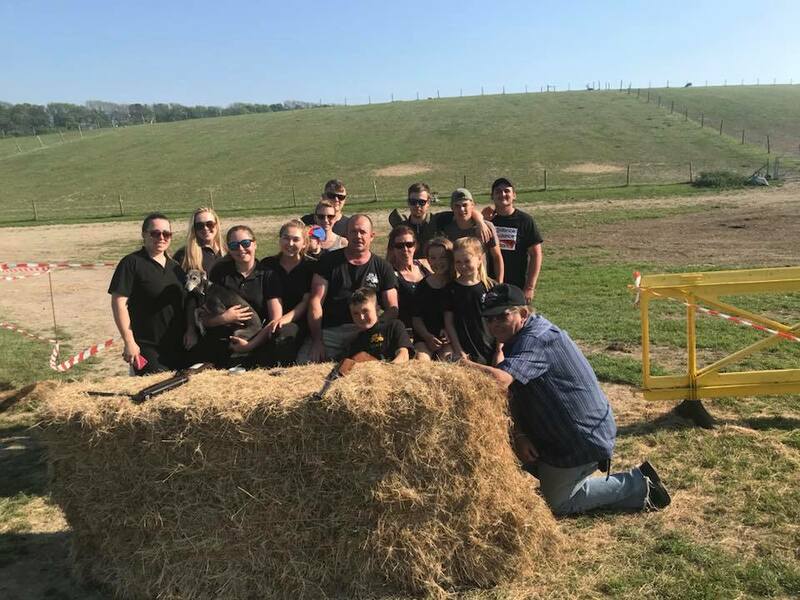 The team at Telscombe Stud Farm worked extremely hard over the extended weekend and raised a fantastic amount for both the Chestnut Tree House and us. We had a lot of fun visiting a working farm and hope that they will hold the event again next year. A very big thank you to all involved that worked so hard to make the weekend a huge success. Wow! What can we say! A huge thank you to everybody who has attended, contributed, donated, and helped us over the last 2 days at our open day! We have really been so lucky with the weather and the turnout was just brilliant, everything flowed smoothly and we have had such a fantastic time with you all, and amazing feedback! We really hoped you enjoyed our days with us, and we are always looking to improve so please please please leave your comments and photos on our page and let us know what you thought! And a huge thank you to all our helpers that gave up their time to help us and made sure things ran smoothly, here’s a few of us this evening having a go at shooting after everybody had left! Once again thank you to everyone, you all made such a difference and made our days working hard enjoyable! From all the team at Stud Farm! Telscombe Stud Farm is situated in Telscombe village, not accessible from the costal part of Telscombe. Instead access is via the C7 between Lewes and Newhaven. The Stud Farm was owned and managed in the early 20th Century by Ambrose Gorham who was responsible for the 1902 winner of the Grand National – Shannon Lass, one of only 13 mares to have won the race since its inception. Upon Ambrose’s death in 1933, he bequeathed his property, Stud farm, in trust to be administered by the Brighton Corporation. Today, the land is owned by Telscombe Village Council where Tim and Nina Armour and family, have been the tenant farmers for the past 30 years.